The Central Synagogue is truly a venue of distinction. Our many halls and marble foyers offer the perfect setting for every occasion; from intimate family gatherings to grand affairs - from joyous celebrations to business conferences. Our state-of-the-art building features underground parking, lifts, well-equipped kitchens, catering facilities and disabled access. There are five distinct areas available depending on the size of your function and specific requirements – the right space will ensure your event is meaningful and memorable. 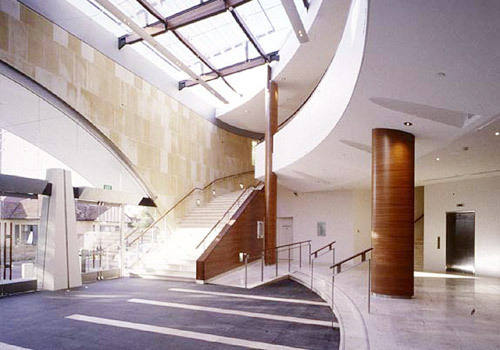 This area forms part of the impressive entrance to the synagogue and can be adapted to suit a wide range of functions such as exhibitions, dinners, displays, cocktail parties and more – its flexibility provides endless possibilities. You may choose to retain the intimate quality of the space for smaller gatherings – with seating in a theatre-style layout. Alternately, opening the bi-folding doors immediately incorporates the foyer area, and offers the capacity for large numbers of events such as Kiddushim. Conveniently, this hall has an adjoining well-equipped kitchen. This is our largest and most elegant hall and can be adapted to suit any event or celebratory function. With a very high ceiling, this large space replete with dance floor is a perfect venue for your Simcha. This hall also has a large adjoining fully-equipped kitchen. The foyer which forms the entrance to the hall can also be utilised as an extension or reception area as well. With this space, the sky’s the limit! This room is ideally suited to smaller functions requiring a more intimate banquet setting, Kiddush or perhaps cocktails. It offers a very pleasant, relaxed setting with glass doors along one side, opening onto a lovely outdoor area.